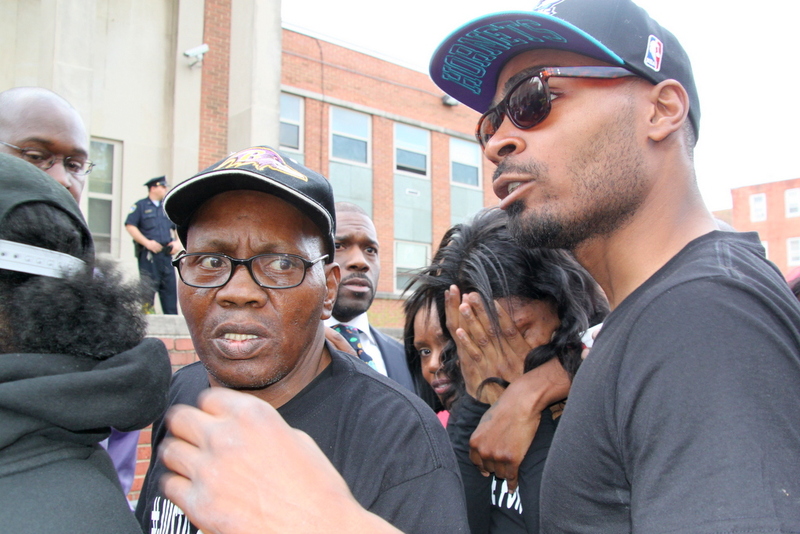 Above: With police officers looking on, Freddie Gray’s mother and other family members break down during the protest march. 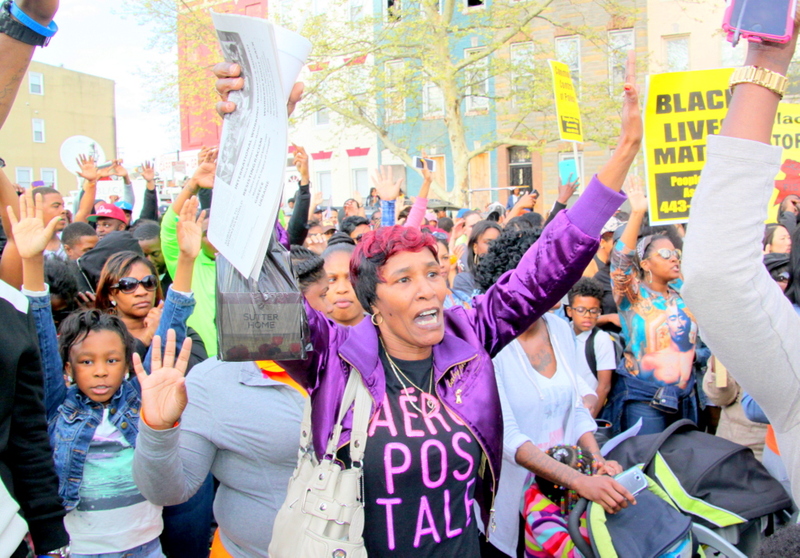 On Mount Street near the spot where Freddie Gray was dragged screaming into a police van – as a crowd of more than a thousand gathered yesterday for the third day of protests following his death – Pricilla Jackson was there. 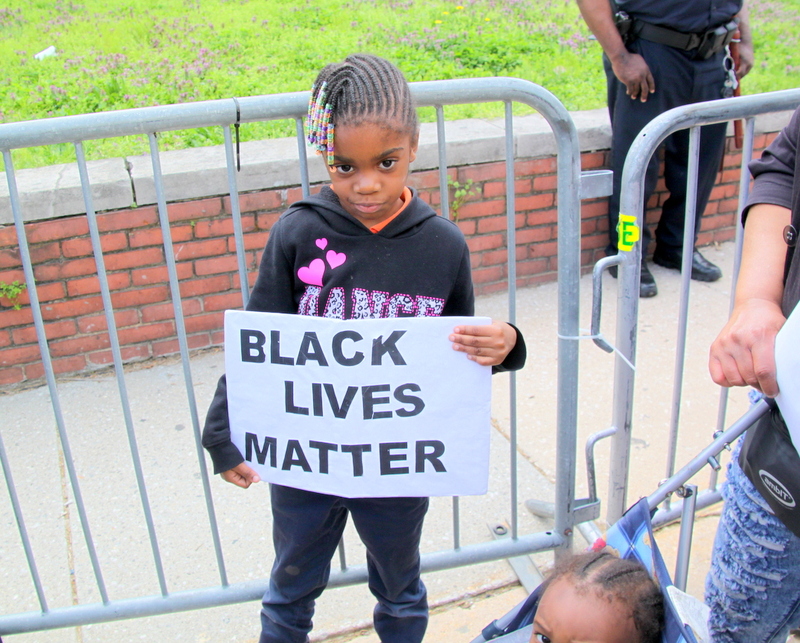 Not just because she knew Freddie, and not just because she fears for the safety of young black men like Gray, who get hurt in encounters with a police department that she feels is out of control. “It’s women, too. It’s older women like me – they’re hurting us when they throw us to the ground and kick us and punch us,” Jackson said, going on to recount what happened to her in January. “While I was angry and I was peeling off layers of clothes, I was crying,” she said. And when they asked her why, she told them. 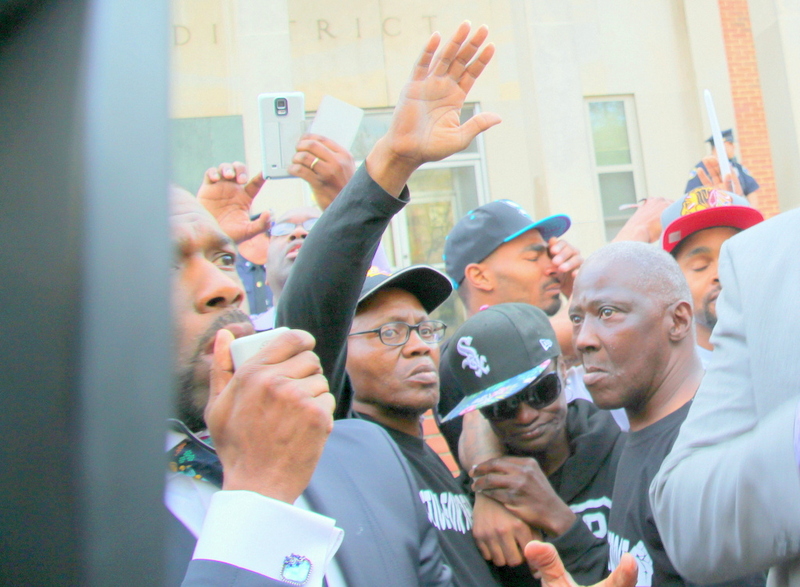 It was the kind of personal story and deep anger crackling through the chanting, praying, sign-brandishing crowd, assembled to demand justice in the Gray case, which now is the subject of a U.S. Justice Department civil rights investigation. 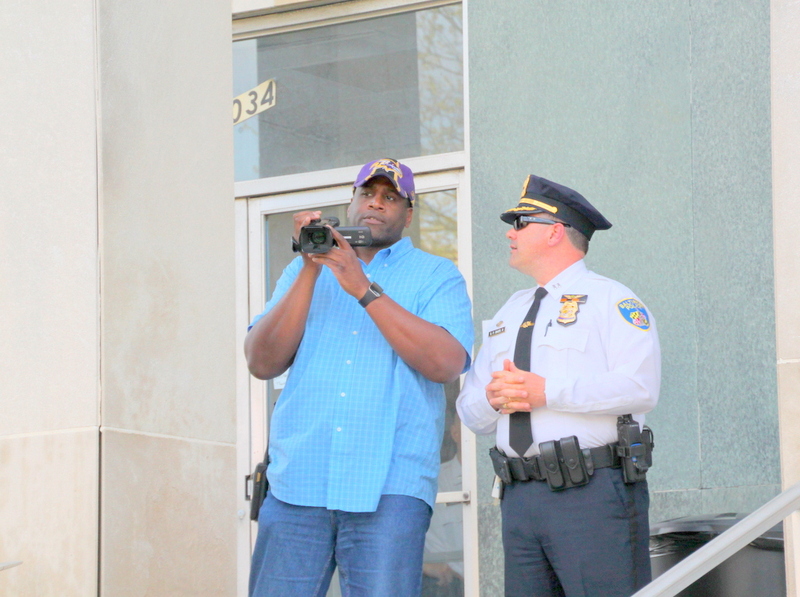 Conducting their own investigations and releasing few details so far about why Gray was stopped and how he was injured on April 12, city officials have nevertheless made statements that have inflamed crowd anger and prompted a media challenge. Appearing to back off, Rawlings-Blake replied that she was only able to judge from the limited information she has seen and that the medical examiner would make the final determination. 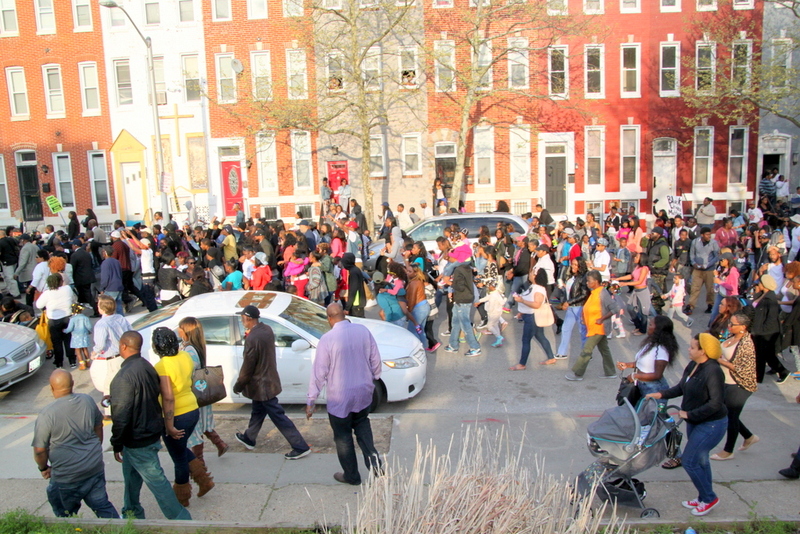 The protest began on Mount Street, at the Presbury Street intersection (the spot where a bystander’s video shows police holding Gray down), and proceeded along Mount to the Western District, which was ringed with police officers keeping the crowd away from the building. The whop-whop sound of a police helicopter throbbed behind the crowd’s chants of “Tell the truth, stop the lies, Freddie Gary didn’t have to die”. At one point, the screaming whine of dirt bikes drowned out everything as about a half-dozen of them cruised down Mount Street through the marching crowd. Hershie Witherspoon, said she lived a block from Gray and grew up with him. “He was very likable, always smiling. . . loved by kids, loved by older, elderly persons,” she said, recalling getting the news of his death on Sunday following a week in a coma. 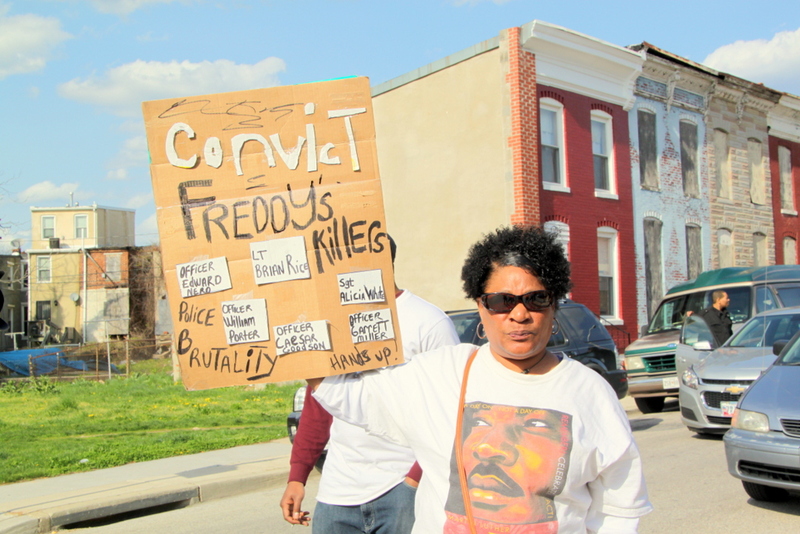 Teresa Zeigler, 49, said Freddie Gray was her nephew. 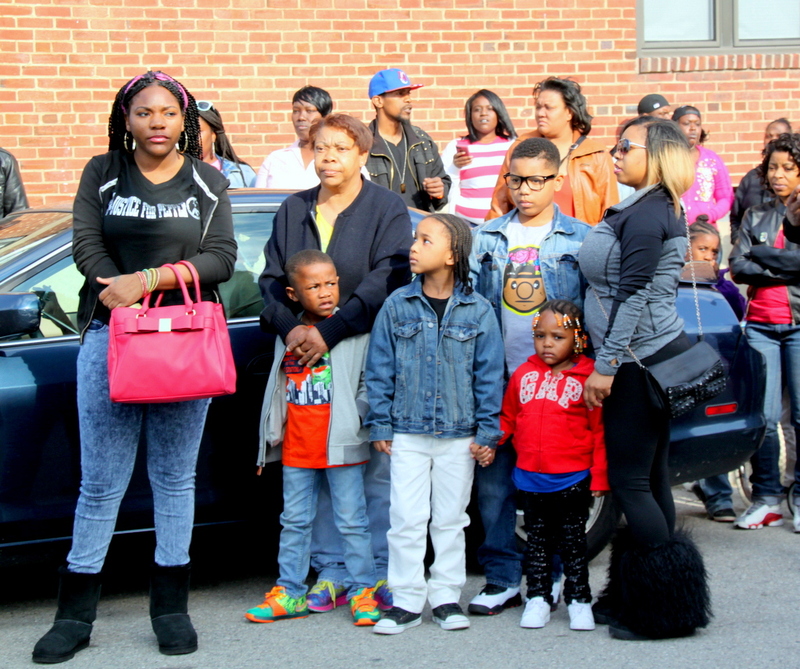 The family, including Freddie’s twin sister Missy, is reeling, said Zeigler. The speakers leading the crowd had more explicit demands. 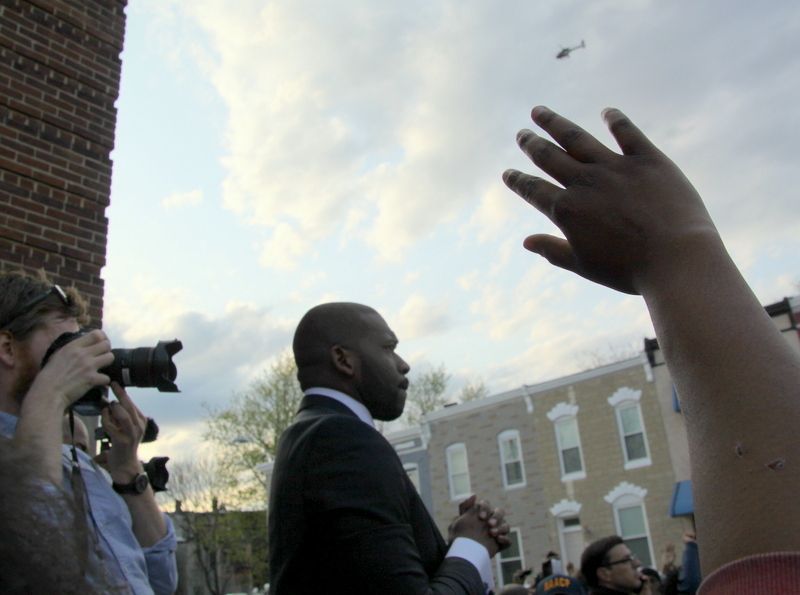 Standing before the police building,Pastor Jamal H. Bryant of the Empowerment Temple gave the crowd a call to action. Police Commissioner Anthony W. Batts has suspended six officers, with pay, in the wake of the incident, but Bryant said yesterday that’s not enough. Family members, meanwhile, said little but spoke with their eyes, which were brimming with tears, and with their gestures. They held each other in long embraces. Gray’s mother, Gloria Darden, covered her eyes with her hands, pulled a hoodie down over her head and at one point doubled over and sobbed. Bryant and Tessa Hill-Aston, president of the local chapter of the NAACP, locked arms with the family members and walked with them from the police station back to the scene of their son’s arrest where a makeshift memorial had been set up. There, one of them, as Bryant led a prayer and the police helicopter hovered overhead, unloosed an eerie, keening wail.